Many grassroots activists, conservative and libertarian idealists are disillusioned with the Republicans. The near-constant bashing of the Tea Party from the insider realists has many thinking the GOP ought to be allowed to fade into irrelevance. But the Republican Party is not going away any time soon. With a little help, it could be the conservative, energized party it ought to be. It would be great if other organizations joined with FreedomWorks and urged their members to repopulate the GOP as well. Are you a member, or fan of one of these grassroots organizations? Consider taking a few hours a year and joining with fellow activists in the Republican Party. If just 200,000 of us did this, we could change the direction of the Party and win elections while staying true to our beliefs. 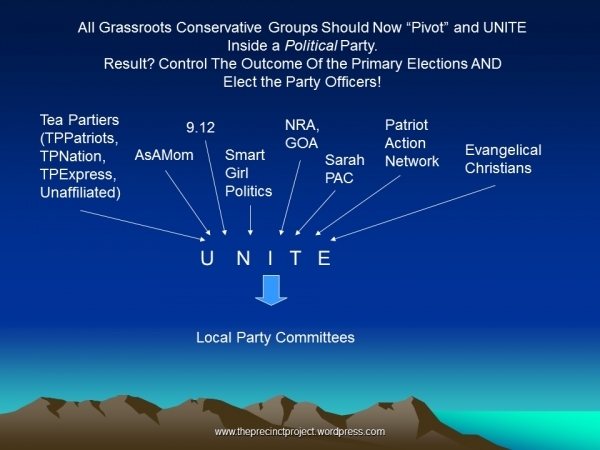 When outside group members join their local party committees, they don't quit their outside groups. They merely become more effective. You vote in a precinct. Each political party is supposed to have a person (or in some states morethan one) assigned to your precinct. The precinct representatives in an area form that area's local committee. The representative is called a "Precinct Committeeman," "precinct chair," "precinct captain." The name varies. We'll just call that person the "PC." The PC represents your precinct to the party, and the party to your precinct. Google your state GOP, and click around to find your local committee chairman. Call them, and go to the next meeting. Call your County Clerk, and ask for the number of your local GOP committee chairman. If they don't know, ask for the number of a local elected Republican. If all else fails, contact me on twitter or Freedom Connector. The folks at the Precinct Project are collecting the particular instructions and terminology for each state. Once you have the phone number, call your local committee chair. Find out the date and time of the next meeting. Go to the meeting, and try to get along with people. As always, if people don't like you, they won't hear you. You're there to learn and grow the party, not subtract from it. The people there may be place-warmers, they may be there only out of self-interest, or they may be just like you. In fact, everyone is a mix of motivations. So don't say you're going to "take back the party" or "take over the GOP." Avoid using terms like "RINO" and "true conservative" until you know what kind of people are there already. Discover the relationships and loyalties. There are probably people in your local Republican party who have been busting their tails for years while you sat around -- that was the case with me. They may have become burned out, and in need of encouragement. In any case, the last thing they need is for someone to announce a hostile takeover. Unless you have a lot of allies, it will take time. Fortunately, that time will be used to advance the cause of freedom. Your short-term goal is to become a PC. That may happen at the first meeting, or it may take a while. Every state has different rules, and local committees have discretion to exclude people who are only there to cause trouble. There again is a good reason to get along with people. Nationwide, half of our precincts have no one to take care of voter turnout, no one to recruit election judges, no one at the local level for vetting candidates. Do you think voter fraud is a problem? Become a PC, and recruit people to watch the voting process. If we do this in every precinct, even if we don't solve the problem completely, we will at least know its actual extent. It may take time to move up the Party structure. Sometimes, if the local party is completely in disarrary, you may be put into a leadership position right away. It may take an election cycle or two before you learn the ropes. Learn the rules, do the work, and you will move up. While some say the purpose of a poltical party is simply to win elections, I describe it differently. In the next installment, you'll see that the purpose of a political party is to get out the vote for a platfrom. Taking the next step into influencing the culture and politics of your nation is a lot more difficult than it should be. The political parties should be reaching out to every voter in every election, asking for volunteers. With your help, we can be sure that every Republican knows who is their PC, and as many as possible vote. Thank you for a real life example of how to participate at a local level. I have voted Libertarian for the past 30 years without regret. But the way things are going I might have to reconsider my approach. Good job on explaining all that Loren , we must never give up and keep the faith.